PFC Converter tool not only converts AOL PFC file to PST but it also converts the emails to file format. 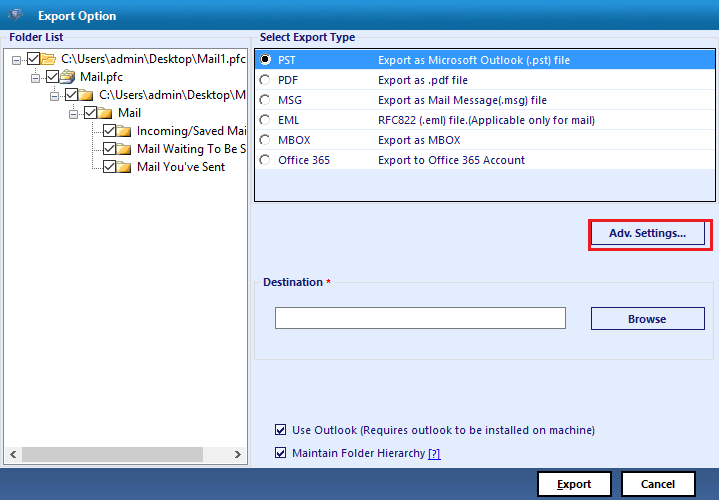 file is supported by Mail, etc., & PST by MS Outlook. This tool also allows users to convert AOL PFC to PST by selecting several emails with attachments and other items. With the help of this feature, important time can be saved by skipping unnecessary emails. Users can add multiple PFC file one by one for conversion and then the tool can export them individually or in bulk as per the requirement of respective user. User can apply filtration before conversion process. Emails can be filtered with respect to date range, which allows users to export AOL PFC to Outlook. AOL PFC to PST converter is supported by all Windows OS (10/8.1/8/7/Vista/XP). It is totally compatible with all Windows OS and free from any required extra patches or add-ons. The option allows users to find a particular file easily amongst a number of other similar files. Some featured naming conventions: subject wise, DD-MM-Year, DD-MM-Year + subject & auto increment etc. 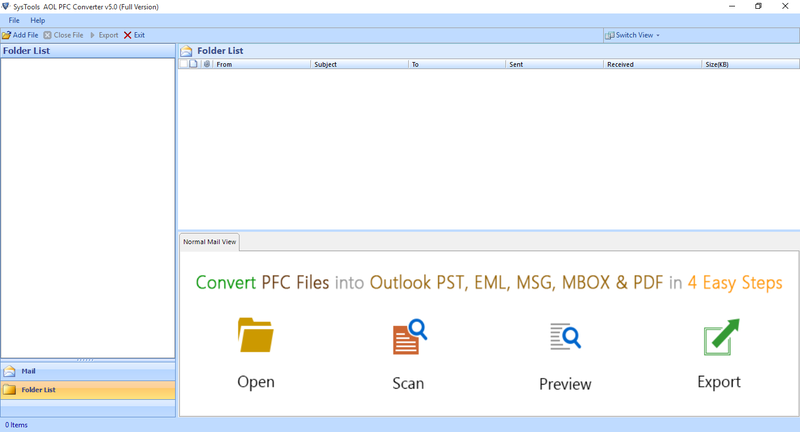 AOL PFC to Outlook PST converter tool maintains same folder and file structure after conversion in case of PFC to and PFC to PST conversion, which helps users to access their emails easily. PFC file is also called Personal Filing Cabinet, which is used to store mails accessed through AOL Desktop Software on local computer. PFC is responsible to view AOL emails locally when users are not even connected to Internet. PFC file can be accessed by using AOL Desktop software. Separated PFC file is created for Each AOL Desktop user. PFC file cannot be accessed from any guest user account, users have to login using their credentials to access AOL PFC file. Hence, these attractive features make AOL PFC to PST Converter software an efficient tool that provides conversion without any loss of data. Does this software require Outlook to convert PFC to PST? Yes, for successful conversion process the software requires Outlook to be installed and configured on the conversion machine. Does this software require AOL Desktop Software installation too? Yes, PFC converter does not require any software to convert AOL PFC to PST. Can I install AOL PFC File converter on Mac Platform? No, You cannot install it on your Mac Computer. This software only supports Windows Platform to convert AOL PFC to Outlook. How bulk convert multiple PFC files to PST stored at different locations? You can select all files one by one and proceed for the conversion of the bulk data after selection. I was thinking to migrate from AOL to Outlook since the last six months but I could not get any trusted software. However, this AOL PFC to PST converter tool proved the efficiency of conversion service and trust. I checked it using its demo version first and then purchased its full version. I am a network admin in my company and my job is to keep an eye on each employee's data. I had several employees working with AOL accounts and wanted to convert their PFC into PST. However, I could not get any trusted tool, which could help me to convert AOL PFC to PST in bulk. Soon after using this tool, I would say that it is amazing for migration from AOL to Outlook.